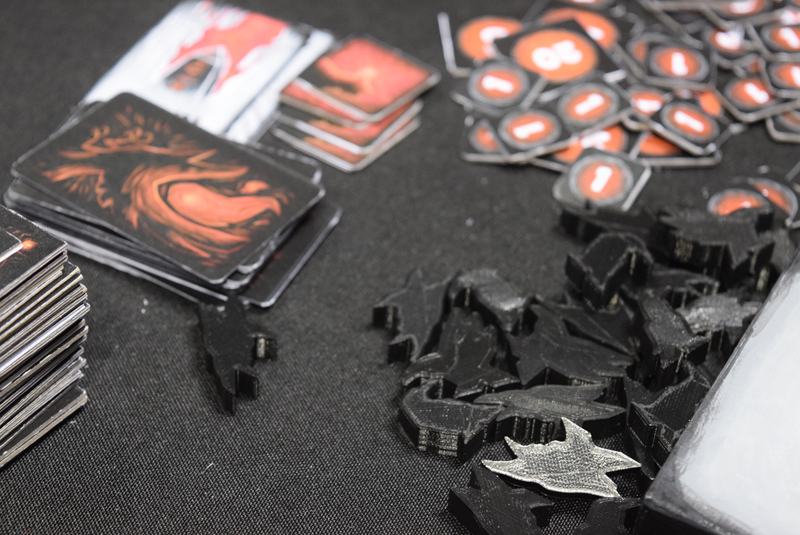 Crows is a 2-4 player tile placement game designed by Tyler Sigman (Designer of Darkest Dungeon for PC and PSN). In the game each player is trying to lure crows to them by placeing tiles with shiny objects on them (crows love shiny stuff). Once all tiles have been placed, the player who has the biggest flock of crows wins. The game was originally published in 2010, but Junk Spirit Games is putting out a new an improved version of the game! After seeing the game at Gen Con 50, I spoke to David Gerrard of Junk Spirit Games to get some more info about the reprint. Jess: Hi David! Thanks for chatting with us. So, how did this team up between Junk Spirit and Tyler Sigman happen? David: Tyler lives in my area and I just happened to be “Johnny on the spot” when he was telling the story of the original Crows, that the company that publishes it was no longer in business. I asked to see the game and I thought it was great and definitely should be out in publication. I pitched the idea to him and I think the real selling point was getting Justin Hillgrove to do the art, and also bringing a new level of graphic design and quality to his game. Jess: What big differences can we expect for this version vs the original? David: I would note again that the biggest difference you will see is Justin’s Art for the game. 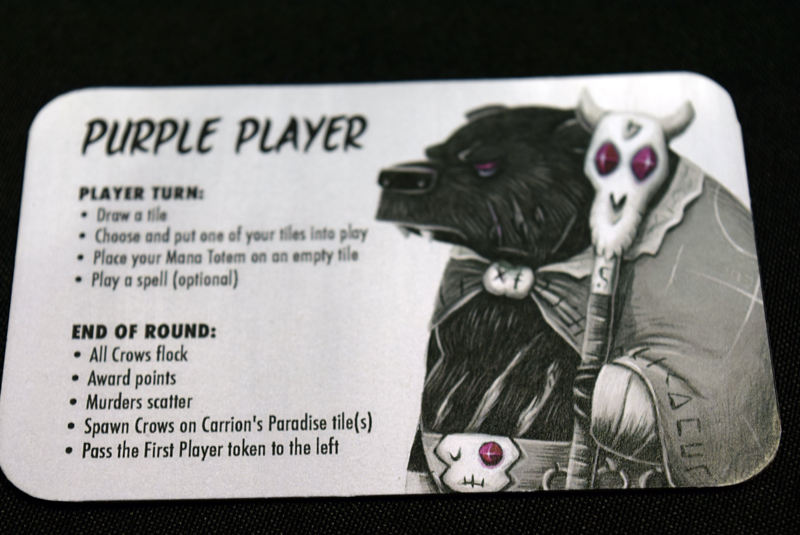 With his art, Travis’s graphic design, and the high quality that Junk Spirit Games brings to all of their titles, Tyler Sigman’s Crows will feel like an entirely different game from the original. For gameplay additions, I asked Tyler if he was OK with me adding some strategic changes to the game and he thought it was a great idea. He first sent me a list of potential changes that he compiled over time and I had a few suggestions as well. We went back and forth through email to see what we liked enough to either tweak the original rules or just completely add into this new version. Obviously we didn’t touch the core of the game, but we’ve added more variety of options for the players to consider during their turns, adding to the strategic complexity of the game and we’re pretty happy with where it is now. Jess: The art for the game is striking. Why did you decide to do such a stark color palate? 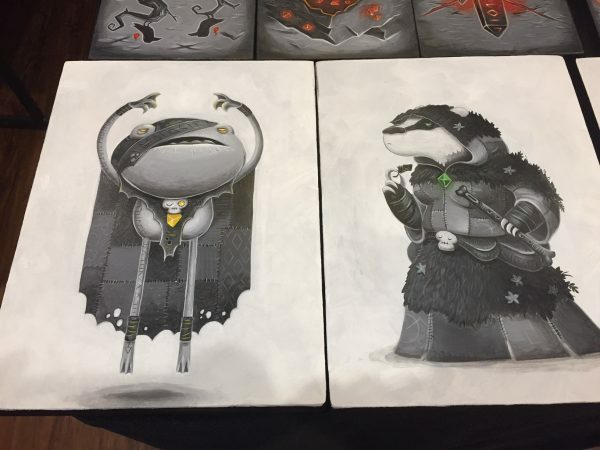 David: Justin Hillgrove has a number of pieces he has made during his artist career where he went with a simple color palette to emphasize the one (or two) colors he chose. When I showed him the original Crows, he showed me some of his older pieces that featured ravens and crows where he only used black, white, and red. He thought it would fit the theme that we had constructed for this republication and after some initial sketches it was easily locked in. Jess: I’ve heard that Cows will be set in Tessandor, the same world as By order of the Queen. Why did you decide to include it? David: When we originally created By Order of the Queen, we wanted to create a structure where we could easily create other games inside of it. We have some other ideas of taking parts of the world and making mini-games to flesh out the lore of Tessandor. When we got Crows in hand, we thought telling the story of the dark and desolate Obsidian Wastes would go well in adding a thematic element to the game. Simply enough, once we started brainstorming about the idea, it just fit perfectly together. Jess: You recently brought the prototype to Gen Con. How was the response? David: The response for By Order of the Queen has been overwhelming for sure. The world that we’ve created in Tessandor is connecting with people and its great to hear that they’ve all had a great time playing a game in that world. We really wanted to create an immersive high quality experience. Most reviews are noting that the art, theme, and quality are over the top for a second title from a team that is so small. Its definitely a great encouragement to us and motivates us to keep going. Jess: This all sounds great. When is the Kickstarter going live and will there be any special rewards for backers? 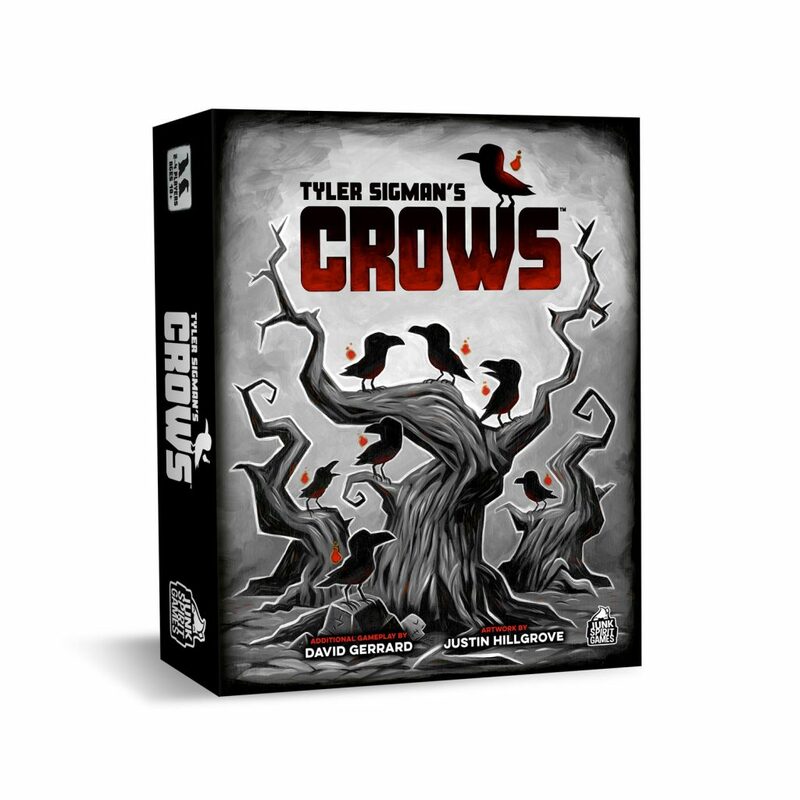 David: Tyler Sigman’s Crows should go on Kickstarter on either the last week of September or the first week of October. We will have two pledge levels for a physical copy of the game – Retail and Deluxe. The retail version will be the version that (hopefully) will get out to stores once we release. And the Deluxe version will be a big boost to content and quality, including metal coins and some cool art additions. Also, we will have stretch goals that will be specific to the Deluxe edition. Jess: I’m super excited for Crows! It sounds like it is going to be a ton of fun and all of the art I’ve seen so far for it is amazing. Many thanks to David for giving us a deeper look into Crows. You can learn more at junkspiritgames.com and keep an eye out later this month for the Crows Kickstarter campaign!